“SC4ALL” is the only company in the world to be able to offer sailing holidays to people with physical disabilities. The aim of the “SC4ALL” is to promote the integration of able-bodied and physically disabled people through sailing adventure holidays and associated activities. The “SC4ALL” believes that all individuals should have the opportunity to sail a sailing boat. They seek to provide voyages for individuals who are able-bodied or have physical disabilities. All voyagers, who sail with the “SC4ALL”, do so on equal terms irrespective of disability. “DSC4A” manager, and occasional skipper, captain Antonis was born in 1962, and began his love with the sea at an early age. He often would watch the fisherman leave on their daily trips. 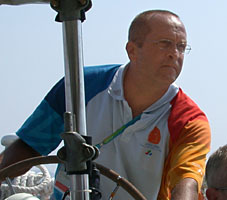 He started his sailing practice at an early age, in the “flying Dutchman” class, at the Piraeus Sailing club in 1976. He then continued sailing around the Greek Aegean and Ionian Sea, with open seas boats, and participated in many regattas, for more than 10 years. His professional sailing experience in the Aegean and Ionian Islands, since 1989, is second to none. He speaks fluent English and French, and native in Greek. He believes his clients are the most important asset. He always shows them the best Greek islands experience possible.